One chapter in UP Diliman: Home and Campus (UP Press, 2010) describes how Professor Emeritus Virginia “Betty” Flor-Agbayani, then an instructor at the UP School of Fine Arts, looked upon the site of the new UP Diliman campus, which in 1949 was a vast frontier land overgrown with cogon grass, with only two concrete buildings and the Sierra Madre mountains as backdrop, and declared it beautiful, “like a cathedral without walls”. The UP budget, however, had no provision for faculty or staff housing at the time. Later, “sensing that Agbayani was really a pioneer at heart” according to the book, UP President Vidal Tan approached Agbayani and her husband, Mariano Leano, and asked whether she was willing to “volunteer” to build her own home, using their own money. They agreed, and the Agbayanis built their first home, the first permanent house in the Diliman campus in the site known as Area 1. 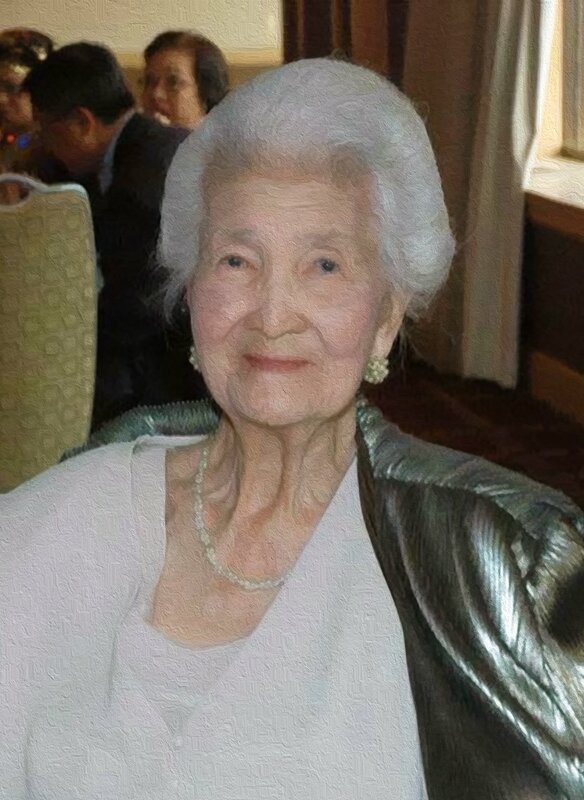 “Pioneering” is a word that was associated with Prof. Flor-Agbayani throughout her life and career until her passing on October 22, 2018 in Sherman Oaks, California, at the age of 96. Born on May 20, 1922 and hailing from Batac, Ilocos Norte, Prof. Flor-Agbayani graduated with a Bachelor of Fine Arts degree from the UP School of Fine Arts in 1947. During her college years, she became Junior Council and Student Council representative, was president of Pallete and the Brush Association, chairperson of the Fine Art’s Woman’s Club, and a member of Phi Alpha. She was a staff artist of the Philippine Collegian from 1946-1947, and an associate editor and a staff artist of the 1947 Philippinensian. After graduating in 1947, Prof. Flor-Agbayani worked as an instructor at the UP School of Fine Arts, and was instrumental in the transition of the School of Fine Arts to the College of Fine Arts in 1970. In 1975, she became the country’s first woman to be given the Fine Arts full professor rank. 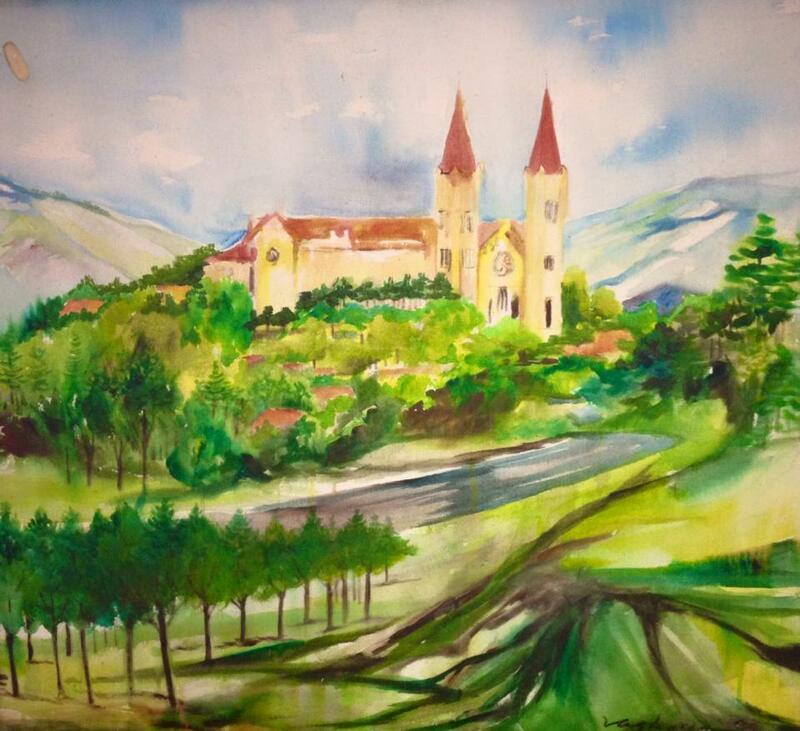 Prof. Betty Flor-Agbayani’s “Baguio Cathedral” (1970). She served as the chairman of the Studio Arts Department, and was College Secretary, Graduate Program Coordinator, Officer-in-Charge, and then Associate Dean of the UP College of Fine Arts, where she taught undergraduate and graduate courses and mentored many of the country’s master artists and National Artists. After retirement, she was conferred the title of Professor Emeritus, and continued to lecture and conduct graduate program activities. 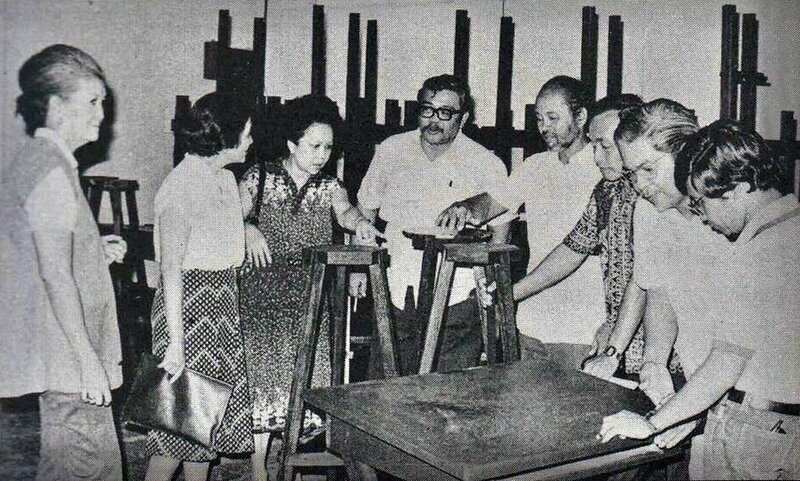 Prof. Betty Flor-Agbayani (1st from left) with National Artists Larry Alcala (4th from left) and Napoleon Abueva (4th from right). Source: Artists and Models Ball Souvenir Program 1980. Her passion for art education in the country also led her to teach at and nurture budding artists from the Philippine High School for the Arts, where she served as Director by appointment of the Philippine President. She was known, nationally and internationally, as “The Grand Dame of Philippine Art Education” for her pioneering efforts and innovative approaches in the inclusion of art education at the primary and secondary levels, and in the development and nurturing of numerous world-class artists from the Philippine High School for the Arts and the UP College of Fine Arts. She was also an Arts and Archeology consultant to several international government and professional organizations. She was a British Council Fellow and Scholar, served as Director of the Southeast Asian Ministers of Education Organization Projects in Archeology and Fine Arts (SPAFA), and as World Councilor for Southeast Asia and the Pacific region of the International Society for Education through Art (INSEA). An award-winning scholar, Prof. Flor-Agbayani also spoke frequently at national and international venues, and even after her retirement, continued to present papers and lectures on Philippine history, art and culture in universities and civic organizations in the United States. 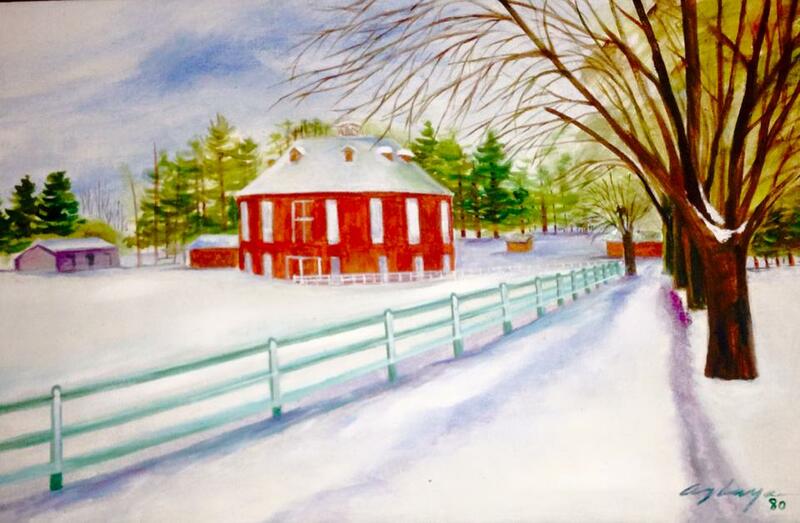 Prof. Betty Flor-Agbayani’s “Red Barn” (1980).